Are More Pension Cuts Looming? The only question now is what’s next when it comes to cutting state pension plans in Oklahoma? Gov. Mary Fallin has signed into law a bill that ends pensions for new state employees under the Oklahoma Public Employees Retirement System (OPERs), moving new hires into 401(k)-styled plans that don’t offer a guaranteed benefit. 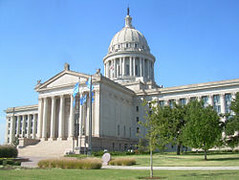 The bill, pushed by top conservative leaders, such as Fallin and Oklahoma Treasurer Ken Miller, is only the first step in the deliberate act of gutting pension systems for state employees, including teachers. Conservatives have deployed the usual rhetoric of “reform” in their attack, and state employees let it happen without too much protest. What chance did they have to stop it, anyway? Lost in all the conservative self-congratulatory and grandiose statements after the bill was passed and then signed into law were these two points: (1) State lawmakers and other leaders have failed miserably through the years to fully fund the retirement systems here for state employees, and (2) if no new employees are paying into the old defined-benefit system how can it possibly remain solvent. Conservatives will force the crisis to take away pensions. It’s really that simple. Perhaps, the most incredulous argument has been made by the editorial page of The Oklahoman, which whines that because most employees at private companies have defined-contribution plans or no plans at all, then it only follows that government employees should join them in this country’s current great race to the bottom precipitated by growing income inequality. The rich, after all, need their tax cuts and loopholes so the rest of us can have a lousy retirement or no retirement at all. Speaking of the rich, lawmakers this session also made permanent gross production tax cuts for the oil and gas industry, which at one time used to pay 7 percent on wells. Now the tax rate will be 2 percent for the first three years of a new well and then 7 percent after that. The tax cut bill was practically written by rich oil and gas executives. The oil and gas industry is experiencing a mini-boom here and its earnings are up so tax cuts are needed. Get it? That’s what passes for responsible governance in this place. Republicans here bank on the fact that not enough people will see through their strategy or even care, and as long as Barack Obama remains president, they will remain in complete control of the government here. Taking away people’s retirement security while giving unneeded tax cuts to the oil and gas industry tells Oklahoma’s current political story all too well.